Oh! 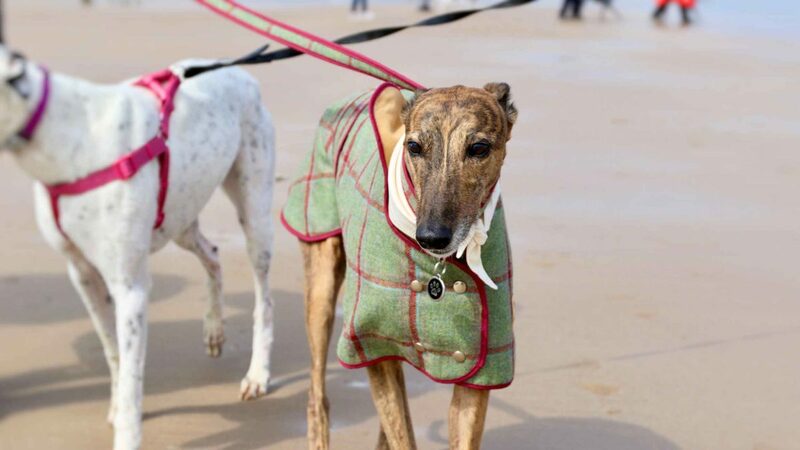 We do love to be beside the seaside at Sighthound Social Club! As we’re based in Yorkshire, our members and their hounds visit the East Coast a fair bit for some fun in the sun. SSC: What happens when the SSC go to the beach Violet? Violet: Well, the humans have fings to do first which is very important, they find a date and then contact the SSC Captain of the Tides to make sure there is going to be some beach for us to walk on! On the day we look at our checklist to make sure we have a) treats, b) water and bowl, c) muzzle, d) a towel for sandy paws, e) mat/blanket for after walkies. Then we sets off nice and early and us hounds get to snooze for an hour or so. When we get there, we have lots of hound sniffs and the humans get teas, coffee’s and when everyone has arrived off we go for fun on the beach. Its great! We do walkies for about half an hour then when there’s a big space away from other doggies we take 2-3 hounds into a small group and when they have their muzzles on they get to go free range for zoomies. Then leads go on and some more hounds can have play time. The humans are careful that we don’t get too excited because we don’t want any injuries and trips to the vet. No, no no. Not everyone likes to go free range and that’s totally cool, you can just hang around and get given treats while everyone is busy chatting and taking photos. Its Pawsome!! Then we all have a nice stroll back to the café for the big treat fest. If you put on your best begging face you can normally get a bit of fish or burger or a chip. But best of all, ice cream! Nom nom. There’s always plenty of water from the humans so we have a good slurp then have a lay down on our mats, zorstid. If it’s a hot day we keep super cool with our cool coats on. After all that we go on the long road home and snooze until dinner is ready. Then snooze some more! Are dogs allowed on the beach at Filey and Whitby? In short, yes, they are, but there are times when we can’t go there, this is from 1st May to September. So, we go on different days out instead. Simples. There are some beaches that are friendly to hounds all year, like Fraisthorpe but they can get busy in the warmer months. Fancy making a weekend of it and staying over? For more, have a look on the SSC forum, there are a few recommendations on there for you to look into. It would be great to see you and your hounds on one of walks or why not join our forum and share your sighthound experiences with us? You can also like our page on Facebook and follow us on Twitter. We look forward to meeting you soon! Tell us about your favourite coastal walks!